His head just hit the side of the seats. 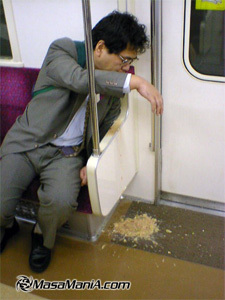 Somebody had a little bit too much to drink and is now on the floor of the train. With each passing minute, he gets closer and closer to laying sideways down there. He’s not a bum. He’s far from it. He is wearing a Citizen watch, a down-filled North Face jacket, and has shoes just classy enough to be self-employed or work in a casual office. He’s hanging on to the side of the seats, while balancing precariously on the balls of his feet. This is too difficult, so he shifts to his rear end. He’s bent over and praying to the balding 40-something sitting next to me. Komazawa-Daigaku station. It’s not a popular station, so not many people get off the train. That’s good, since our sleepy friend is now in a relaxed position, knees bent and hands behind him, and head bent down towards the floor. His eyes haven’t been opened for a while. Sakura Shin-Machi station. It’s the one with the pink tiles. Our friend is getting quite a bit of attention. People see him on the floor with his eyes closed and can stare without feeling embarassed. He is bumped into the jeans of a white guy. The 40 something has hit him on the head and asked him where he’s off to, and is making a deal with him to get him to sit down next to me. He’s going to the same station as I am. I anticipate that I will be getting a drunk blanket pretty soon here, and will have to tell this fellow once we reach the station. Our unusually helpful friend has wished our drunk one “a job well done”, which doesn’t translate into English well. The train is ready to resume operation, now that the express has passed us. 20 more minutes until my home station. The countdown begins, and we will see if this man can stay in his seat for the duration of the ride. We’ll also see what will happen with the contents of his stomach. Mr. Acer netbook has just received a friendly little headbutt. Just a little “hello”. The sound of the air being forced out of the tunnel as we emerge from the subway. The echoes are gone now, and the click-clack of the tracks becomes more audible. He has left the train, perhaps a half-dozen stations away from his final destination. Godspeed, you wiggly man. May you find your way home some day. Godspeed.